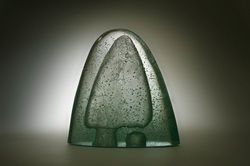 Hand Made Glass is an artistic collaboration between Emma Borland and Mark Ammermann. Our studio is in the village of Monbulk, situated in the picturesque Dandenong Ranges on Melbourne's eastern fringe. We specialise in glassblowing, glass fusing, and lost wax casting. We make a variety of art including jewelry, cast bowls, fused glass panels, windows, blown sculpture and architectural installations. As qualified art teachers, we also provide workshops. We are available to make work on commission.